Wow, say that title three times fast! 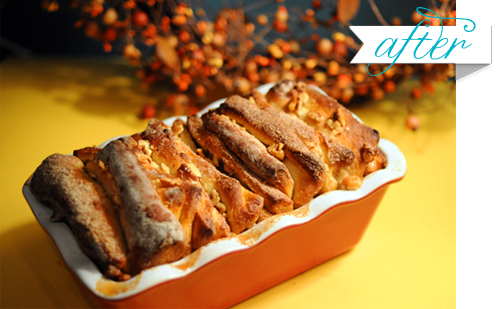 This pull-apart yeast bread is simple and the process of making it is really fun. 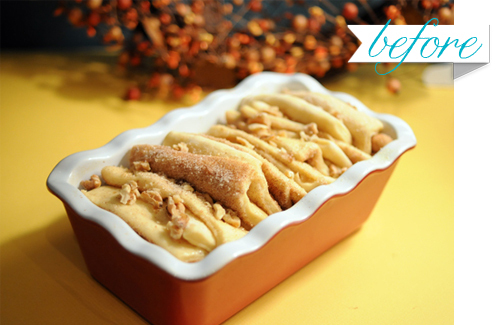 Plus, it's made with cinnamon, sugar and butter so your kitchen will smell AH-MA-ZING! 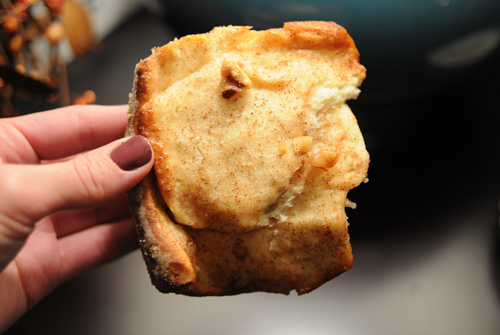 Seriously, if you ever need to impress anyone, bake anything in your oven that has cinna-sugar and you're sure to please any nostril. 1. 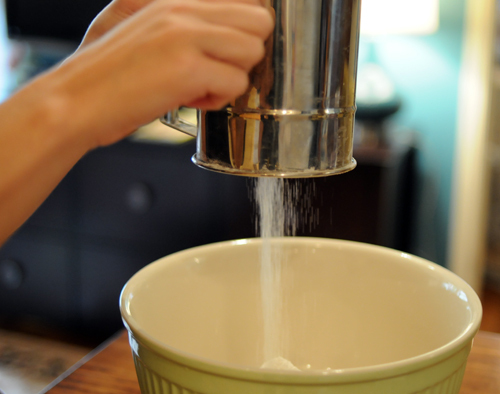 In a large mixing bowl sift together 2 cups flour, sugar, yeast, and salt. Set aside. 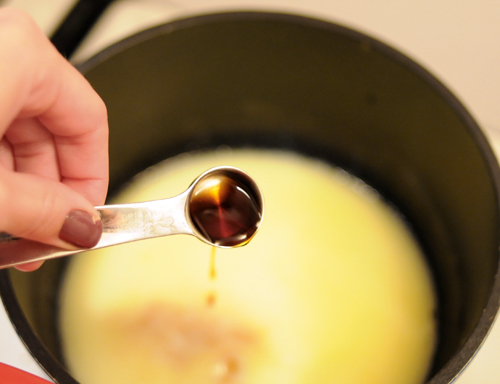 In a small saucepan, melt together milk and butter until butter has just melted. Remove from the heat and add water and vanilla extract. 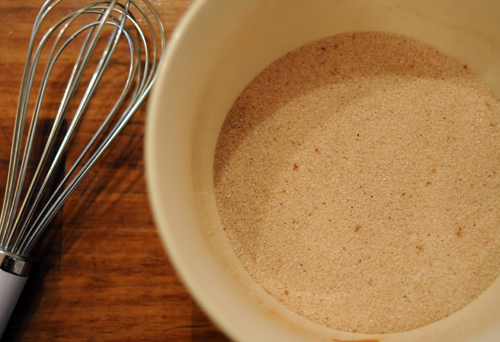 Let mixture stand for a minute or two, or until just warm to the touch. 2. 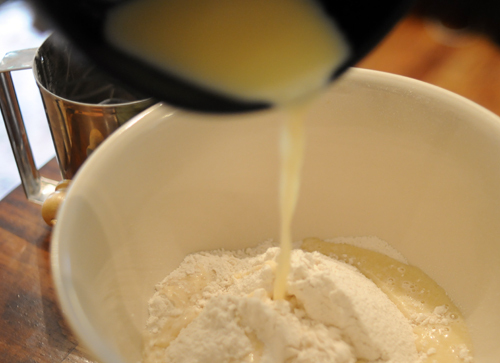 Pour the milk mixture into the dry ingredients and mix with a spatula. 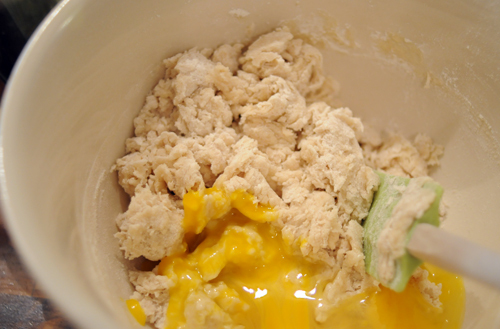 Add the eggs and stir the mixture until incorporated into the batter. 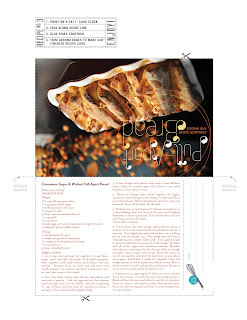 Add the remaining 3/4 cup of flour and stir with the spatula for about 2 minutes. 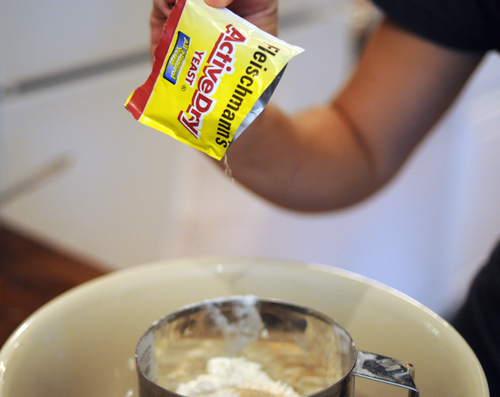 The mixture will be slightly sticky. 3. Cover dough with plastic wrap and a clean kitchen towel. Place in a warm space and allow to rest until doubled in size, about 1 hour. 4. 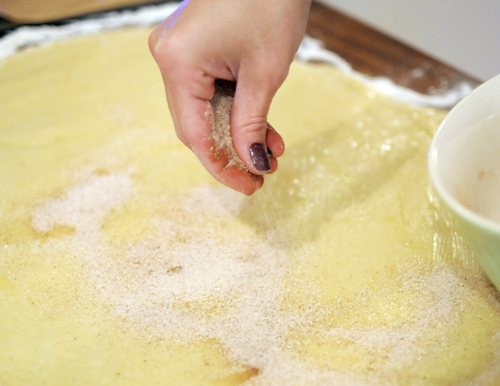 While the dough rises, whisk together the sugar, cinnamon and nutmeg for the filling. Grease and flour a 9-inch loaf pan. 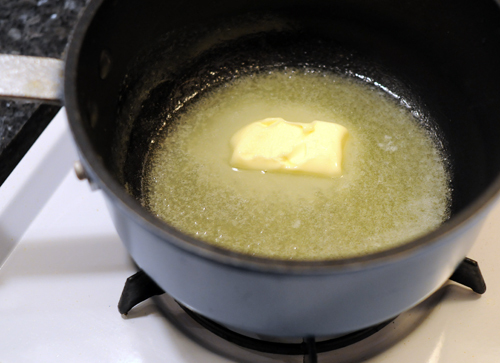 Melt 2 ounces of butter until just browned. Turn off the heat. Set all aside. 5. Preheat oven to 350 degrees F. Spread out walnuts on a lined baking sheet and toast in the oven until slightly browned, or about 3 minutes. Turn off the oven, let cool and chop coarsely. Set aside. 6. Punch down the risen dough and knead for about a minute. Cover with a clean kitchen towel and let rest for 5 minutes. 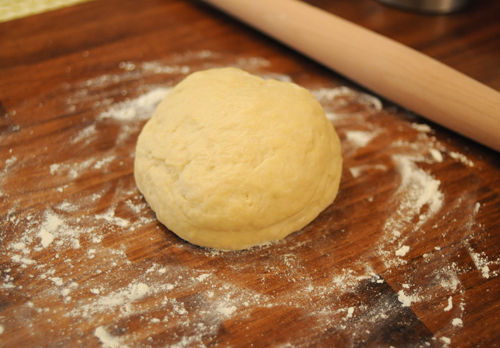 On a lightly floured work surface, use a rolling pin to roll the dough out. 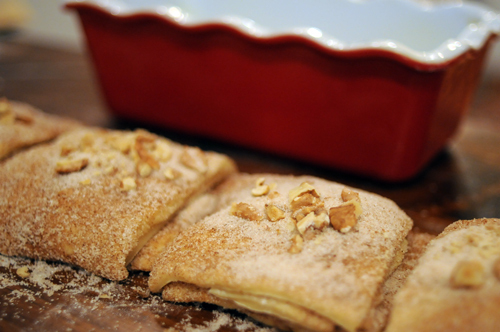 The dough should form a rectangle approx. 12x20 inches wide. 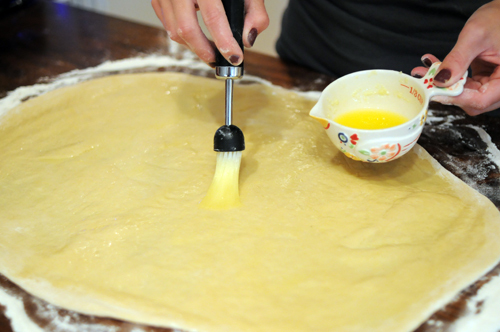 Use a pastry brush to spread melted butter across all of the dough. 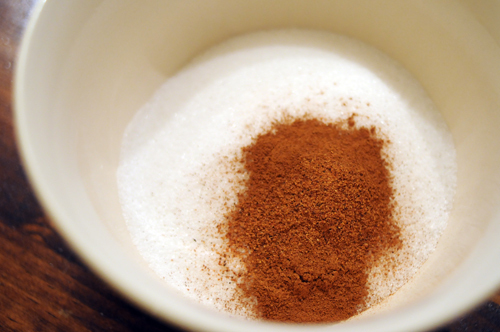 Sprinkle with all of the sugar and cinnamon mixture. 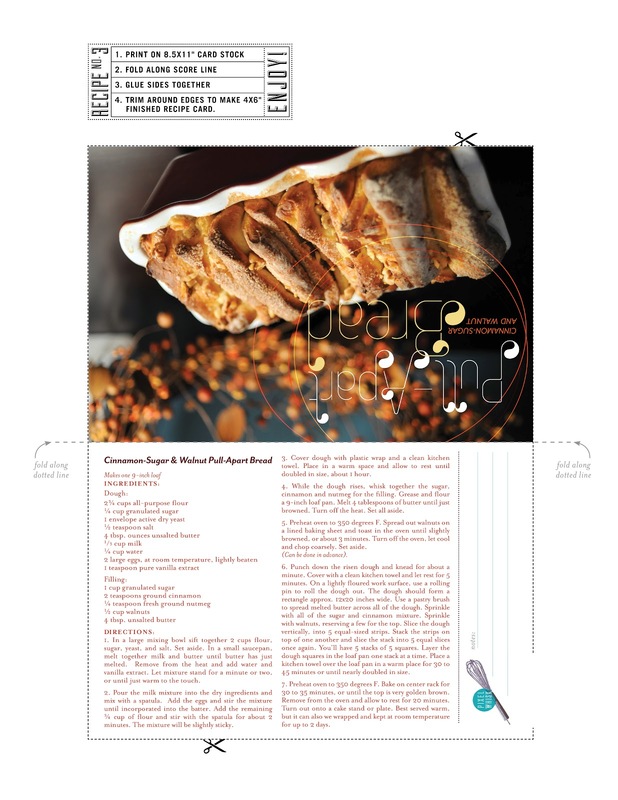 Sprinkle with walnuts, reserving a few for the top. 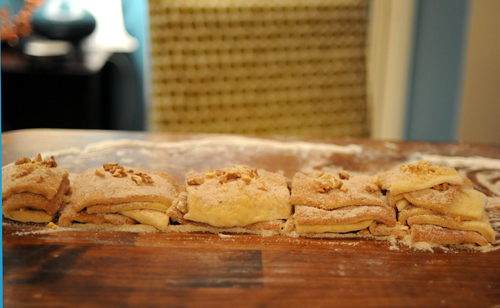 Slice the dough vertically, into 5 equal-sized strips. Stack the strips on top of one another and slice the stack into 5 equal slices once again. You’ll have 5 stacks of 5 squares. 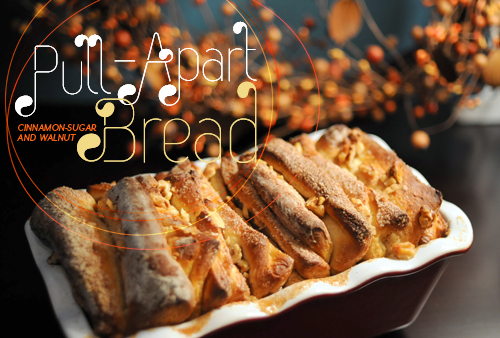 Layer the dough squares in the loaf pan one stack at a time. 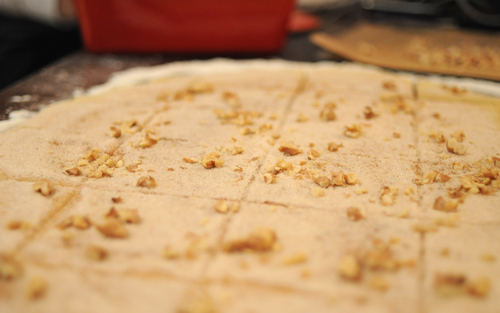 Sprinkle the top with the remaining walnuts. Place a kitchen towel over the loaf pan in a warm place for 30 to 45 minutes or until nearly doubled in size. 7. Preheat oven to 350 degrees F. Bake on center rack for 30 to 35 minutes, or until the top is very golden brown. Remove from the oven and allow to rest for 20 minutes. Turn out onto a cake stand or plate. 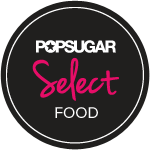 Best served warm, but it can also we wrapped and kept at room temperature for up to 2 days. This looks so yummy, it's making my mouth water!